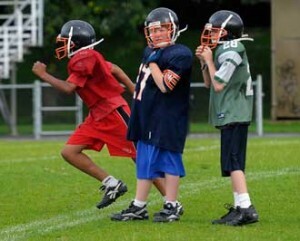 Members of the ACES program’s Peewee football team during a 2008 practice. From left to right: Axel Kalonji, Braydon Burnett and Brian Phelps. / Photo: Graham Hughes, The Gazette (Montreal) © 2008. Redmen volunteers the “backbone” of ACES program, founder says. That’s how Det.-Sgt. George Widz explains the philosophy of the youth football program he runs in some economically challenged neighbourhoods in the southwest part of Montreal. And since 2006, members of the McGill Redmen football team have been helping him drive the schoolbus. Widz established the ACES (Action concertée en élaboration de solutions) football program in Point St. Charles in 1994. The 33-year veteran of the Montreal police force spent the latter part of his career at Station 15 looking on is dismay as more and more area kids dropped out of school and, inevitably, ended up in trouble. Fifteen years ago, Widz, a lifelong football player and fan, decided to do something about it. The Redmen players do their part by serving as instructors in the ACES Spring Program, weekly training sessions that serve to feed the ACES teams which play in the summer and fall. About a dozen players volunteer each year. The ACES approach is a simple one: Stay in school, be a good citizen, and you can play with us. Former Redmen wide receiver Tim Kraemer was part of the first group of McGill players to begin volunteering his time and has returned every year since. The Terrebonne native, who graduated last fall with a degree in Physical Education and now teaches at Lower Canada College, hopes to keep helping in some capacity. And Widz says he couldn’t do it without Kraemer and his Redmen teammates.